We live in a world where we don’t need to remember much. I sometimes refer to my phone as my brain. I put calendar events, tasks to accomplish, and phone numbers into my phone so I don’t need to remember them. I can always look them up at the appropriate time. Do you remember back in the day when you had to remember people’s phone numbers? I can still remember phone numbers of the friends I called as a kid. They are ingrained into my mind. But I cannot tell you a single phone number of a person I regularly call today. Once I enter the number into the phone, the phone remembers the number for me. Why do I need to remember it? The same with the Scriptures. I have a computer program where I can search for Bible verses and topics I want to find. Maybe there is a verse where I remember the basic wording but don’t remember exactly where it is located. I can do a search with a few keywords and quickly find the reference in multiple translations. Then there is Google. What can you not find on Google? The point is that we don’t need to memorize anything because we can always look it up. 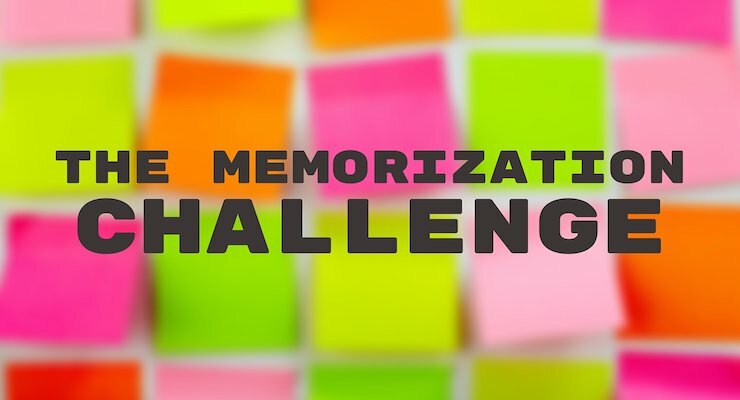 Writing the Word of God on our hearts is about more than memorization, but memorization is part of the process. It is easy to take for granted the that we can always look up something. This is a luxury we should not take it for granted. What happens if I were to drop my phone and break it? What happens when my computer’s hard drive goes bad? What happen’s when Google is hacked, and the website goes down? We can’t always rely upon these luxuries. Temptation will come at an inopportune time. Your best defense against temptation is God’s Word. When temptation comes your way, you are not going to have the luxury of looking up a particular Scripture reference. You will either have it with you or not. When Jesus called upon the Scriptures in the desert, he called upon them from memory. Ephesians 6 speaks of spiritual warfare. It tells us to “stand fast to withstand in the evil day” (Ephesians 6:13). We are to take up the whole armor of God which includes “the sword of the Spirit, which is the Word of God” (Ephesians 6:17). In other words, take it with you. There is no better way of taking it with you than memorizing it. So here is a challenge. Take one verse a week. That is not much. I am sure you can do it. If you memorized one Bible verse a week, that would be 52 verses you would memorize over the course of the year. A good place to start would be the beginning of the Sermon on the Mount. Spend the next ten weeks memorizing the Beatitudes in Matthew 5:3-12. I will make these the official verses of the week for Greater Things. I am also going to encourage my church to take part in this challenge. I pray that you will accept this challenge and join me on this journey. I will be interested to hear how you go about memorizing these verses. Share in the comments below if you are willing to join this challenge! On a final note, we have a new Facebook Page. If you haven’t liked Greater Things on Facebook, make sure to do so today! I will make sure to post the verse of the week on the site. I will take the challenge. I hope the Holy Spirit inspires me! This is a wonderful Idea to start memorization of verses. Thank you! Thank you Pastor Phil for the encouragement to memorize. It is a worthwhile challenge and so valuable to commit those scriptural Words to memory in our mind and heart. When they are in our memory we are able to speak them in prayer any time during the day or night. I have heard and read the Beatitudes most of my life, but could not repeat them to save my soul. I guess it’s time to save my soul and memorize them. Thank you for the challenge. I love a challenge! I will definitely be doing this. Thank you! I’ll be taking this challenge with my two young children ages 8 and 3. I will take the challenge. Thanks for making it. Thank you. I think this is so very important. The night after my son died in a trucking accident I prayed the 23 Psalm as I laid in my bed. I am so thankful that I had it committed to memory. I am 73 now and it is not as easy to memorize but I will do my best. God’s blessings on all who try and to you and your ministry. I’m coming in a little late yet have started this challenge! I bought your book & I recommend it to all. I know that I’m late responding, but I want to take the challenge!!! I looked on the FB page and see that the latest verse is Psalm 1:1. Please include me!!! I’m so excited to have more and more of God’s word down on the inside! !